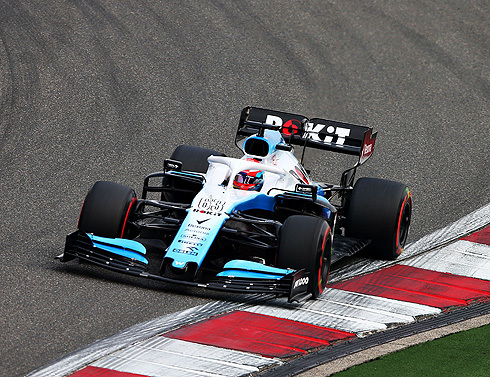 Qualifying for the 2019 Chinese GP would see a fight between the two ROKiT Williams Racing Team drivers with the end result seeing George Russell finishing ahead of team-mate Robert Kubica. Both drivers would complete several runs on the soft tyre with the pair swapping positions. After their runs George would be ahead of Robert by just 0.028s. Their overall positions would see them again at the rear of the field in 17th and 18th with Sunday's race going to again be another difficult race for both drivers. 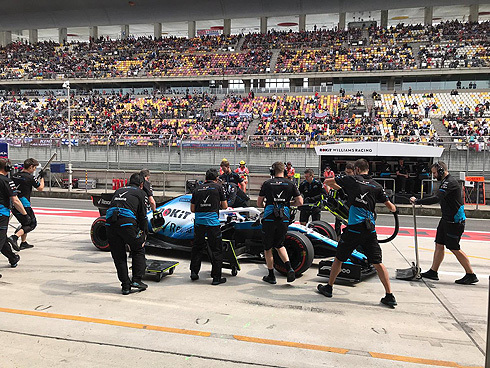 There would be just 19 cars for qualifying for the 2019 Chinese Grand Prix after Albon's practice crash. Both Williams cars were out early in the opening eighteen minute period and would complete their laps and would pit. The track would become very busy as Vettel set a 1m:33.557 followed by Leclerc, who had lost some time in traffic. Everyone was on the soft tyre for their first runs as Raikkonen went third. Bottas would go quickest with a 1m:32.658 followed by Hamilton and Vettel. Kvyat was now 4th. Verstappen was now in 3rd ahead of Vettel. Hulkenberg was now 5th followed by Grosjean, Kvyat, Magnussen, Ricciardo and Gasly 10th. Leclerc had dropped to 11th. Both Williams drivers would complete a second run on the soft tyre with Robert moving ahead of George. 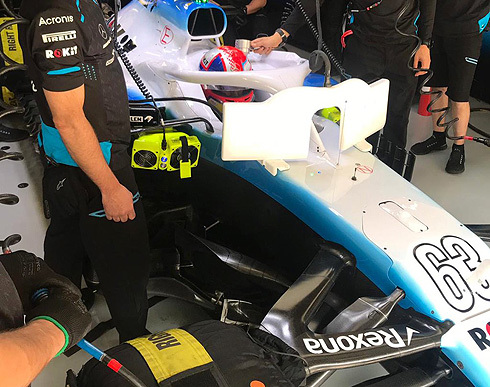 Giovinazzi would not set a time joining Albon at the rear of the grid. The Williams drivers were 17th and 18th adn out of qualifying. The second period would see several drivers; both Mercedes, Ferrari and Verstappen, all come out on the medium tyre. The rest of the top fifteen were all on the soft tyre. First runs would see Bottas quickest from Vettel, Leclerc, Verstappen, Hamilton, Gasly, Kvyat, Magnussen, Ricciardo, Hulkenberg in tenth. Of the top drivers some would return on soft tyres and with the end of the period it would be Hamilton quickest with a 1m:31.637 running on the medium tyre. Bottas was second followed by Vettel, Leclerc, Verstappen, Gasly, Hulkenberg, Magnussen, Grosjean and Ricciardo tenth. The final period of qualifying would see the first runs with Bottas quickest from Hamilton, Vettel, Verstappen, Leclerc, Gasly, Hulkenberg, and Ricciardo. Neither Haas car would run in the first runs. On the second runs Bottas would retain his pole position as Hamilton could not improve. Vettel and Leclerc were second and third followed by Verstappen, Gasly, Ricciardo, Hulkenberg, Magnussen and Grosjean tenth. Sunday's race will see the Williams drivers start from 17th and 18th with the option over the tyre they will start the race on. Robert would be first out in qualifying running on the soft tyre. He would set a 1m:37.421 after an uneventful lap. He would pit after a 3 lap run. But he would return quickly for another run. He was able to find time setting a 1m:35.440 to move ahead of his team-mate. Another lap from Robert seeing him complete three runs in the period. Robert would set a 1m:35.281 to remain 17th. He would drop behind his team-mate as George completed his third run. But at least Robert made continual improvements. In post qualifying interviews Robert would say: "The balance shifted quite a lot ... which I was not expected. Second run car balance came back but nothing like yesterday." He was asked about his expectation for race. Robert will add "Will be a long race ... difficult to know what will happen ... we struggle more than others ... long race to manage the tyres so we will see." George would also come out early also on the soft tyre. George did find time over his team-mate setting a 1m:36.821 pitting after a 3 lap run. George would also return for another soft tyre run. George would set a 1m:35.462 to now be behind his team-mate. George was also back out for a third run. George would set a 1m:35.253 to move ahead of his team-mate. George would come on his radio saying that his last effort was a "rubbish lap".